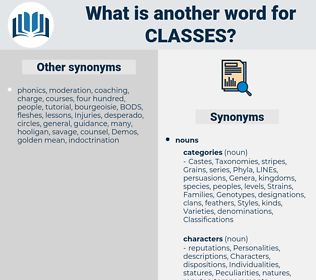 What is another word for Classes? outstanding, industrial, 'immigration, CCA, lesson, lessons, lecturer, within, U.S., continuing, immigrant, immigrants, cambodia, classe, existing, kitimat, pending, pipeline, mama, underway, dance, train, notice, notices, past, prof., courts, NSTP, HAV, quebec, present, Fy, opinion, opinions, DEG, on-going, prime, grade, grades, class2, KLASS, teaching. 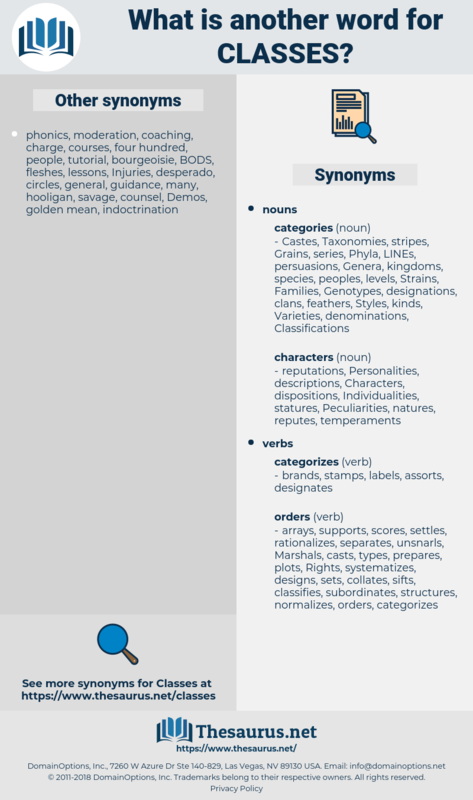 age-classes, year-classes, class-rooms, acts, characteristics, leaders, Scales, schoolchildren, subcategories, fields, Scholarships, Curricula, Curriculums, years, educational, sailings, qualifications, professionals, Households, Families, channels, Academies, installments, policymakers, sub-categories, sequences, Syllabuses, Hierarchies, segregations, colleges, disciplines, hours, operations, configurations, Learnings, schoolrooms, decision-makers, Klas, batches, instalments, tolerances, physical, retrainees, politicians, talks, watercourses, stakeholders, individuals, attendances, placements, Mattresses, allocations, serials, matters, ways, Sciences, learners, descriptions, Concentrations, aspects, teachings, Casualties, substances, rankings, grass-roots, teachers, tranches, denominations, Populations, proceedings, species, halls, dispatches, purposes, levels, skills, tutorials, accusations, attributes, sects, papers, Varieties, times, divisions, sessions, sections, elements, series, spectrums, subdivisions, registered, physics, slabs, buxibans, intervals, segments, parts, audiences, grassroots, peoples, Styles, factions, slices, Trainings, quarters, collections, Beneficiaries, LABS, cycles, scores, Communities, development, Workshops, proportions, contents, participants, stakes, arms, valid, credits, circles, brackets, packages, Traineeships, tiers, dimensions, cases, sittings, systems, situations, Internships, CADETS, Programs, seniors, assessment, arrangements, stages, affiliates, definitions, competencies, components, panels, delegations, provisions, profiles, Universities, Holidays, dispositions, issues, programmes, examples, sorting, Frequencies, suites, rates, personnel, echelons, patterns, earners, elite, steps, Elites, backgrounds, chapters, gradings, positions, Occupations, totals, terms, headwaters, blocks, layers, allegations, Ships, courtyards, spheres, labourers, swathes, fellas, Industries, criticisms, seats, waterways, shells, seasons, places, walks, streams, ratings, strands, rings, experiences, heights, modalities, sources, cadres, typologies, modules, pools, domains, pillars, marks, Commodities, increments, Leaves, slots, cohorts, Expenditures, backyards, rooms, graders, seams, formations, tribunals, designs, Areas, tasks, coatings, ranges, chamber, numbers, topics, promotions, versions, yards, coats, Criteria, shapes, Studies, models, responses, centers, theatres, agendas, Chips, baskets, trainees, Tracks, subjects, shops, juniors, FORMATS, creditors, departures, sizes, teams, Pupils, hearts, quotations, organs, CAMPS, sets, heading, actors, tools, gradations, deals, sub-items, insights, questions, periods, sorts, portions, employees, sticks, storeys, Films, limits, rations, editions, currents, column, Genera, Phases, start-up, Angles, flights, Deliveries, brands, approaches, pieces, bands, buildings, payments, intakes, fellows, shares, quotas, results, Workmen, functions, Chaps, slides, kids, events, reviews, workers, boughs, diapers, works, expenses, grounds, Beans, offerings, fries, trip, trips, wings, limbs, Prices, bouquets, Houses, modes, rows, centres, fours, trades, waves, queues, paragraphs, Entities, Boxes, Charges, reaches, Stories, Strokes, points, methods, posts, Forums, shifts, trends, items, dudes, genres, months, Floors, peers, zones, stuffs, members, venues, Beds, boys, chairs, two, units, Fruits, themes, Trees, beings, vines, Rivers, sub-units, flows, sheets, twigs, Bodies, rounds, men, guys, Persons, 2001, counts, runs, meetings, LINEs, lessons, immigrants, courts, grade, grades. grade, grades, caliber, homeroom, teaching. Progressed, completed, race, enrolled, taught, studied, Commenced, Examined, developed, applied, substances, Carried, Occurred, continued, materials, conducted, jog, Offered, Ran, courts. Assessing, belonging, following, according, heading, finding. categorises, closes, identifies, organizes, follows, applies, voyages, defines, rejects, divides, presents, refuses, places, puts, counts. caste, classrooms, lecture, gender, classification, Classifications. classmates, Schools, categorizations, Constituencies, Businesses, Students, graduates, ranks, materials, Children, orders, Ones, age, ages, classrooms, Strata, classification, Classifications. 3. What are Classes, under the parts of speech? For a long while they kept together in their classes; and they were very good friends.